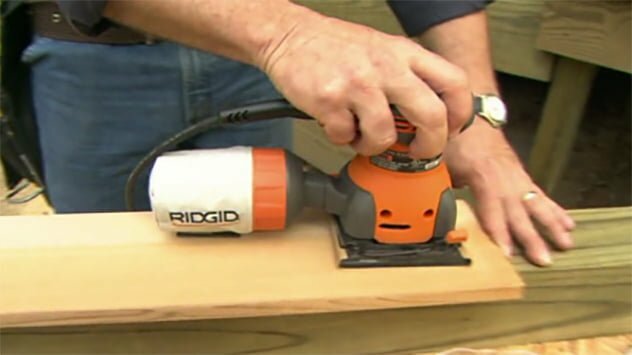 Use an orbital sander to sand wood. Sandpaper is rated numerically according to the size of the grit particles. The lower the number, the coarser the grit; and the higher the number, the finer the sandpaper. Since coarse sandpaper leaves deeper scratches, start with the finest sandpaper that will tackle the project easily and work your way up to finer grits. Here are some common sandpaper grit sizes and what projects to use them one. 40 to 80 Grit Sandpaper: Coarse grit sandpaper is a good choice for rough sanding and removing stock quickly, such as sanding the edge of a sticking door with a belt sander. 100 to 150 Grit Sandpaper: Medium grit sandpaper makes a good starting point for most projects, from sanding unfinished wood to removing old varnish. 180 to 220 Grit Sandpaper: Finer grit sandpaper is great for removing the scratches left by coarser grits on unfinished wood and for lightly sanding between coats of paint. 320 to 400 Grit Sandpaper: Very fine grit sandpaper is used for light sanding between coats of finish and to sand metal and other hard surfaces. The answer is as simple as one, two, three because sandpaper is rated numerically by its grit. The lower the number, the more coarse the sandpaper. For example, you might have a 60-grit sandpaper on a belt sander to remove lots of wood from the edge of a sticking door. A 100-grit paper would be a good choice to remove old varnish from the face of a door or smooth out a newly constructed piece of woodwork. When you really want a smooth finish, it’s best to begin with the most coarse paper first and work your way up to the finer grits. So after the varnish is stripped on that door, step up to 150-grit paper, then 220. And between coats of the new finish you’ll be applying, you can use 400-grit sandpaper. I understand that if the same grit paper is not used for the complete project that lighter or darker spots could appear after staining . IE if I used an 80 grit on part and a 150 grit on the other. The 80 grit will be darker when stain is applied as the wood is more open. What is the difference if I used a 120 grit vs a 150. could I see the difference? Hello, I am sanding red oak before staining. (the wood is very hard and was previously stained). What do I do next before staining? What do I use, or do, to help the stain penetrate more effectively? Thank you for all the tips on sanding that previously provided . I hope can help me with this . Hi we had a new kitchen built and there is a small section of floor we need to do again. Could you please tell me the sandpapers l need for this please. Hello, I’m super new to wood working and Im having a hard time figuring out what grit sandpaper to use or what order to use. I have several black walnut slabs I would like to turn into to different things, they are all pretty smooth right now, I do have a few slabs that have a couple “splinter” spots . I was hoping you would be able to help me out?